The great joy of the Thomas Sill Foundation is working with the good people of Manitoba who pursue those philanthropic efforts that make this such a fine place to live. 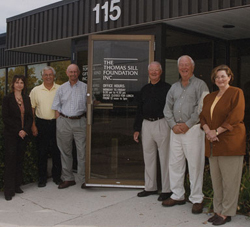 The Foundation was endowed by the late Thomas Sill 19 years ago, but it is empowered by the charitable organizations who deliver a wide range of services and benefits to Manitobans. In our 2005 – 06 year cash grants were made to 105 charities in the amount of $1,253,732. It was our pleasure to personally meet most of these charities at their place of business in Winnipeg or in rural and northern Manitoba. Approximately 60% of these cash grants, by dollar amount, were awarded in Winnipeg with 40% being invested in rural and northern Manitoba. Individual grants ranged in size from $500 to $100,000 including some multiple year awards. On an annualized basis the average grant was $9,500. Please click on “Annual Report” to review each of these grants. Descriptions of these activities can be found by clicking on “Programs / Projects”. As we enter our 20th year we look forward to supporting the invaluable work of Manitoba’s philanthropic sector.